The Admiralty Islands group consists of about 20 volcanic islands, with a total land area of about 800 square miles (2020 km2), located just north of the eastern end of New Guinea, very near the Equator. They are rugged and covered with jungle. Most of the coasts are fringed with coral reefs, leaving only a few small beaches suitable for landing operations. The largest island, Manus, is 49 miles long and 16 miles wide (89 km by 26 km) and its central mountains reach to 2355' (718 meters). Northeast of Manus is found a superb anchorage, Seeadler Harbor, which is 15 miles long by 4 miles wide (24 km by 6km) and was of considerable strategic value in the South Pacific campaign. The main settlement is at Lorengau (147.275E 2.031S), to the south of Seeadler Harbor. The group was discovered by the Dutch in 1616 and given its Western name by Captain Philip Carteret of the Royal Navy in 1767. Controlled by Germany prior to the First World War, the islands were mandated to Australia in 1920. In 1939 there were only 44 Westerners, mostly plantation managers, living in the island group. The indigenous population numbered about 13,000 Melanesians who were favorite subjects for study by prewar anthropologists. The islands produced small quantities of copra, turtle shells, and pearls, the latter heavily exploited before the war by Japanese divers from the Caroline Islands to the north. The islands were also completely undeveloped, with no roads outside the immediate vicinity of Lorengau. A native trail ran along the north coast of Manus, and three trails crossed the interior mountains to the south coast. The Japanese bombed Lorengau on 21 January 1942, occupied Manus on 8 April 1942 with 51 Transport Regiment from 51 Division, and completed a 4000' (1220 meter) airstrip at Momote on the island of Los Negros, east of Seeadler Harbor. In 1943 they completed a 3300' (1005 meter) airstrip northwest of Lorengau. At the same time the garrison was reinforced with elements of 14 Base Force and a battalion each from 1 Independent Mixed Regiment and 229 Regiment. The garrison remained relatively small, numbering about 4600 troops. In July 1943, following his decision not to attempt to take Rabaul, MacArthur was encouraged by the Joint Chiefs of Staff, who had discussed the strategy at the Quebec conference, to take the Admiralty Islands instead. The group was strategically located, had a superb protected anchorage at Seeadler Harbor, and had ample flat ground for airfields on Los Negros, east of the harbor. Furthermore, by seizing the Admiralties, MacArthur would bypass the large Japanese force at Hansa Bay on the north New Guinea coast. A target date of 1 January 1944 was set, but this was pushed back to 1 April due to the Cape Gloucester landings and a dispute over the appropriate command arrangements: Halsey controlled the Seabee units needed to build up the naval base. The decision to make Halsey responsible for developing the base was not made until 28 February 1944. Responsibility for the Admiralties assault was assigned to Walter Krueger, who was allocated 1 Cavalry Division (13,600 men under Innis Swift), 592 Engineer Boat and Shore Regiment, and 1 Marine Amphibian Tractor Battalion (25.974 men); 73 Wing (RAAF; 2488 men); and 9545 Navy and 7103 Army service troops to build up the base. 1 Cavalry Division had no previous combat experience but was nevertheless considered an elite formation, with a large number of regular officers and men, a proud tradition, and the only square division organization remaining in the U.S. Army. 5 Air Force (Kenney) carried out a bombing campaign in January and early February against both the Admiralties and any nearby airfields that might provide air support for the Japanese on the islands, succeeding in destroying an estimated 80 Japanese aircraft on the ground in the Admiralties in one strike in early February. On 22 February 1944, a flight of B-25s found no evidence of Japanese forces at Los Negros and Lorengau. The air strip was overgrown and no troops or vehicles were visible. Encouraged by Kenney, who was convinced the Japanese had pulled out of Los Negros ("ripe for the picking"), MacArthur chose to disregard radio intelligence indicating a garrison of four to five thousand troops were still present. He authorized a reconnaissance-in-force, with the intention of converting this into a full-scale assault if resistance proved light: "... a gamble in which I have everything to win, little to lose. I bet ten to win a million, if I hit the jackpot" (quoted in Taaffe 1998). The order went out on 1500 on 25 February 1944 with the target date set at 29 February. Kinkaid had to order the shore patrol to quickly round up the crew of light cruiser Phoenix so that she could sail in time to support the landings, and MacArthur could no longer expect carrier support from Nimitz, who was not expecting the assault on the Admiralties for another month. Krueger had serious doubts about the assault, as did Swift, who thought at least 2200 men were needed. Krueger increased the landing force from MacArthur's recommendation of 800 men to over 1000 men, the most that could be landed with the available shipping. Krueger also ensured that there would be shipping for a large followup force, which was the key to the operation if the reconnaissance-in-force became a serious invasion attempt. Barbey pulled together a force of destroyers and destroyer transports for the reconnaissance force, assigning his slower LCIs and LSTs to bring in the followup force. On 27 February 1944 a reconnaissance patrol of six Alamo Scouts was brought in by Catalina and went ashore by rubber raft. At 0645 the lieutenant in charge radioed that he "Could not get to river. Lousy with Japs." He and his men were extracted the next day. However, Kenney doubted the reports from the Scouts, and MacArthur felt it was too late to cancel the operation. Initial Reconnaissance. 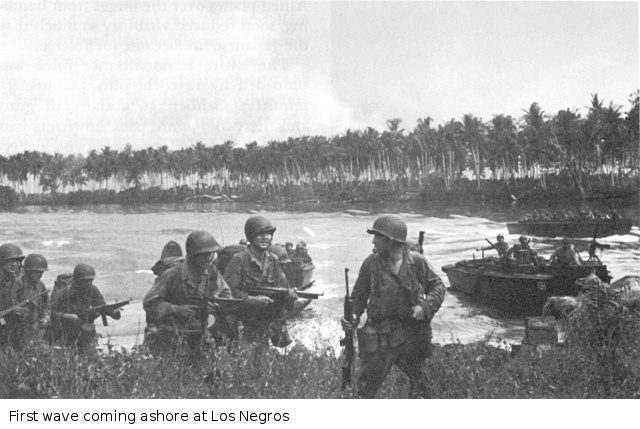 Two days later, 2 Squadron, 5 Cavalry Regiment and supporting elements under William C. Chase were landed on Los Negros. The landing beach selected was at Hyane Harbor. It was very narrow and most of the shore was mangrove swamp, but there was a landing leading directly to Momote Airfield. Colonel Ezaki Yoshio, commanding the Japanese garrison, was expecting the attack. Japanese signals intelligence had intercepted U.S. submarine transmissions from south of the Admiralties, and his troops had spotted the Alamo Scouts coming ashore to reconnoiter. However, Ezaki expected the landings to be at Seeadler or southeast Los Negros and his troops were poorly deployed to meet the landings at Hyane Harbor. Although the the American landing craft encountered heavy fire, particularly in the fourth wave, the troopers encountered little resistance once ashore. Air support and naval gunnery in support of the landings were effective and Momote Airfield was seized by 0950. The landings took over four hours to complete, mostly because there was reluctance to hazard the twelve LCPRs available, which would be needed if there was to be an evacuation. MacArthur, who had accompanied the invasion force aboard Phoenix, went ashore at 1600, awarded a few decorations, and made the decision to convert the reconnaissance-in-force into a full-scale invasion. However, captured documents had indicated that the radio intelligence estimate of the size of the garrison, not the much smaller aerial reconnaissance estimate, was closer to the truth. Chase wisely abandoned the southern half the airstrip in order to tighten his perimeter. A few outposts were set up outside the perimeter while all available 0.50 Browning antiaircraft machine guns were deployed to the perimeter to beef up its firepower. Barbey likewise left two of his destroyers (Bush and Stockton) offshore to provide call fire. Ezaki had positioned 1/229 Regiment in the area around Hyane Harbor and Momote Airstrip, while 2/1 Independent Mixed Regiment was deployed at Salami Plantation (147.408E 2.017S) northwest of Hyane Harbor and a third battalion was at Lorengau. Ezaki was ordered by Imamura to throw his entire force against the invaders; however, rather than take the time to marshal his full strength, Ezaki ordered 1/229 Regiment to counterattack at once and "annihilate the enemy who have landed. This is not a delaying action. Be resolute to sacrifice your life for the Emperor and commit suicide in case capture is imminent" (quoted by Miller 1959). Ezaki apparently grossly underestimated the size of the landing force, thinking only about 200 Americans had come ashore. The Japanese attack began at dusk on 29 February and fell mostly on the southern part of the American perimeter. Although two Japanese infantrymen penetrated to Chase's command post before being cut down, the attack was badly coordinated and was turned back. Some 66 Japanese corpses were later counted within the perimeter, while American casualties were seven killed and fifteen wounded. The next day, the Americans received additional supplies by air drop, and Chase sent out patrols that used information from captured documents to pinpoint Japanese strong points. These were bombarded by the American artillery, offshore destroyers, and aircraft from 5 Air Force. That afternoon, a patrol of 17 Japanese led by the battalion commander of 1/229 Regiment, who had infiltrated the American perimeter the previous night, got to within 35 yards (32m) of Chase's command post. The Japanese were driven back with heavy casualties, whereupon the survivors committed suicide. That afternoon, the Americans went over to the offensive, seizing the revetments west of the airfield. There was little opposition, and the Americans used their engineering equipment to clear fields of fire in front of the new perimeter. Ezaki had ordered a second counterattack on the night of 2/3 March, but his troops were slow to concentrate, and the attack was postponed to the night of 3/4 March. The attack began at 1900 with 2/1 Independent Regiment moving over a causeway passing from the northern part of Los Negros to the Momote area. Heavy gunfire support from offshore destroyers and minesweepers broke up the this column, and attacks by two smaller Japanese columns were poorly coordinated and were broken up by rifle and machine gun fire as the Japanese infantry tried to make their way through mines and trip wires. The survivors pressed on in an unimaginative frontal assault, making no attempts at stealth and, allegedly, singing and shouting misleading orders in English. 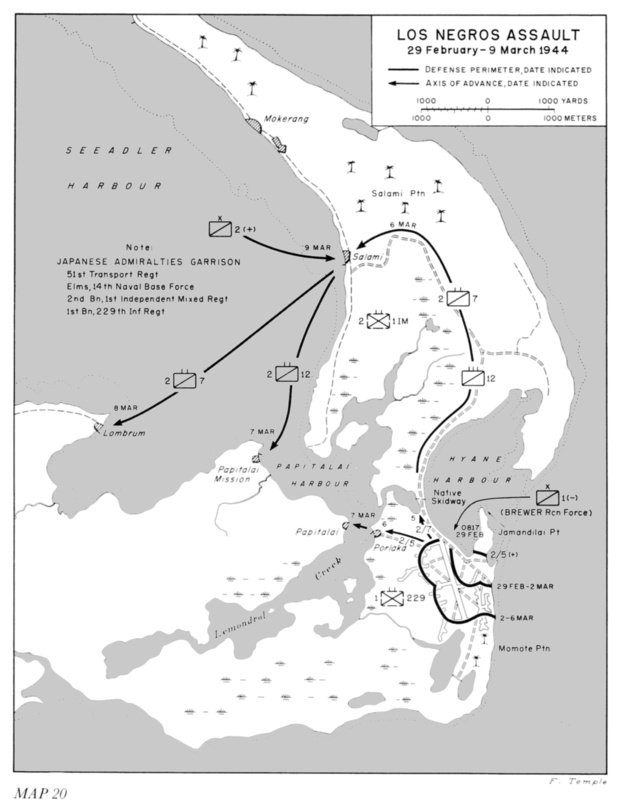 Although some of the American positions were overrun, the Japanese were forced to pull back by dawn on 4 March. They had suffered hundreds of casualties, while the Americans lost 61 killed and 244 wounded. Of the American casualties, nine of the dead and 38 of the wounded were Seabees. The Japanese garrison no longer had the strength to mount any further serious counterattacks. On 4 March 1944, the beachhead was reinforced by 7 Cavalry Regiment. The next day, Swift came ashore and took command of the American invasion force. That afternoon, as the Americans were preparing to attack towards Salami Plantation, the Japanese launched a spoiling attack which was easily beaten off but delayed the start of the American attack until 1630. The attacking squadron, 2/7 Cavalry Regiment, found their advance impeded more by Japanese mines than Japanese troops. On 6 March, 12 Cavalry Regimental Combat Team came ashore to reinforce the drive on Salami Plantation, which was finally seized after an hour-long firefight. On 7 March 2/5 Cavalry Regiment took Papitalai (147.408E 2.053S) in a shore-to-shore movement and 2/12 Cavalry Regiment likewise seized Papitalai Mission (147.397E 2.045S) after a sharp firefight. The next day, 2/7 Cavalry Regiment seized Lombrum Plantation (147.374E 2.041S). All these shore to shore movements were supported by the LVTs of 592 Engineer Boat and Shore Regiment. By 9 March, the Allies controlled about half of Los Negros and had silenced the Japanese gun positions on the islets north of Seeadler Bay, clearing the way for 2 Cavalry Brigade (Mudge) to come ashore at Salami Plantation. The Americans had suffered casualties of 116 dead and 434 wounded while killing 1288 Japanese. A group of 68 Sikhs from the Indian Army who had surrendered at Singapore and been impressed as labor troops were also discovered and released by the Americans. The remaining organized Japanese resistance on Los Negros was centered around Hill 260 (147.385E 2.059S). An attack on 11 March was thrown back when the mortars and flamethrowers of 5 Cavalry Regiment lagged behind the assaulting troops. Reinforcements from 12 Cavalry Regiment joined a second assault on 14 March which, with heavy support from artillery and aircraft, took the hill with only light casualties. Landings on Manus. Responsibility for the assault on Manus was now assigned to 2 Cavalry Brigade. 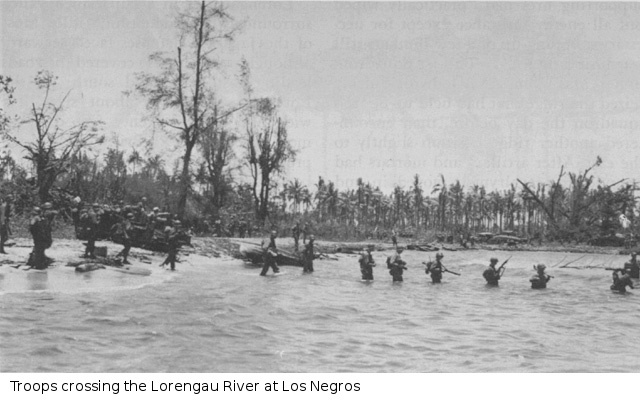 Reconnaissance elements landed on Manus on 11 March 1944 and found the Lorengau area strongly defended. However, there were suitable beaches for landings west of Lugos Mission (147.242E 2.014S) that were almost undefended. Mudge decided to make his main assault here, supported by artillery on the islets of Seeadler Harbor. The islets were probed on 11 March 1944 by elements of 302 Cavalry Reconnaissance Troop. The Butjo Luo group (147.312E 2.027N) was unoccupied, had suitable sites for artillery, and was well positioned to fire across the front of the advancing American troops. However, Hauei (147.286E 1.962S) was found to be heavily defended, and the reconnaissance patrol withdrew in confusion after taking heavy casualties. The PT boat commander bringing in half of the patrol bugged out after being shot through the ankle, but the LCVP commander bringing in the other half of the patrol was made of sterner stuff. He evacuated the survivors, only to have his boat sunk from under him. The remaining survivors of the patrol and LCVP were spotted in their life jackets by aircraft and rescued a few hours later. On 12 March, 2/7 Cavalry Regiment returned to Hauei with heavy artillery, naval, and air support, and secured the island the next morning after taking casualties of eight killed and 46 wounded. At least 43 Japanese sailors were killed. With its supporting artillery sited, 2 Cavalry Brigade was now ready to make its assault. On 15 March the brigade went ashore at Lugos Mission following a heavy bombardment. Japanese roadblocks and a strong Japanese position on a ridge west of Lorengau were reduced with the help of the artillery, and Lorengau airfield was captured on on 17 March. Organized resistance on Manus ended on the 25th. It took until 23 March to reduce the last pocket of Japanese resistance on western Los Negros. The final Japanese strong point, on Pityilu Island (147.225E 1.963S), was heavily bombarded by destroyers and assaulted on 30 March. 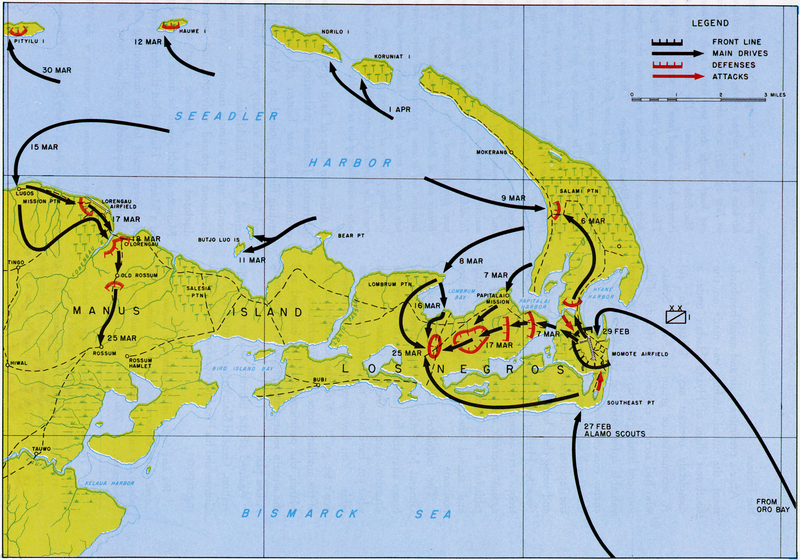 Although a few hundred Japanese escaped into the interior of Manus, the campaign was effectively over by 3 April 1944, and Krueger declared the campaign officially concluded on 18 May. Total Allied casualties were 330 killed or missing and 2200 wounded, included 10 Seabees killed and 59 wounded. Japanese casualties were estimated at 4380 killed and 75 taken prisoner. 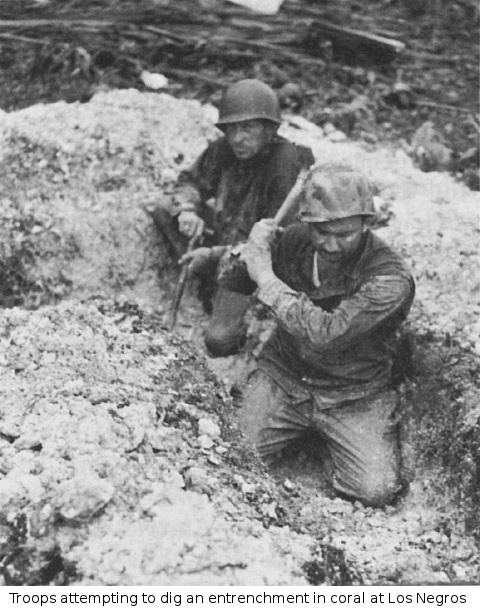 The wild interior of Manus became known as "the Reservation", since inexperienced infantrymen were sent there to hunt Japanese survivors in order to give them some combat experience before deploying further forward. The Admiralties campaign was a remarkable gamble, with a 1-to-4 ratio of attackers to defenders in its early stages. It succeeded only because of massive Allied air and sea superiority, which prevented the Japanese from shifting troops by barge and left them vulnerable to defeat in detail. MacArthur's reasons for taking such a great risk were complex, but Taaffe (1998) has suggested that MacArthur was motivated at least in part by a desire to upstage Nimitz, who had just conducted a successful campaign in the Marshalls. For MacArthur, what was at stake in the battle was his bid for an offensive along the north coast of New Guinea that would return him to the Philippines. Following the Allied victory, Nimitz proposed that Halsey be given responsibility for the new base. This so enraged MacArthur that he ordered base development to be severely restricted. Halsey, who normally got on well with MacArthur, flew to Brisbane and later reported that the touchy general "lumped me, Nimitz, King, and the whole Navy in a vicious conspiracy to pare away his authority" (quoted by Miller 1959). After a heated discussion, in which Halsey accused MacArthur of hampering the war effort, MacArthur finally relented. Momote airstrip was extended to 7800' (2380 meters) by 18 May 1944. Lorengau was abandoned, but a new 8000' (2440 meter) airstrip was completed at Mokerang on the northwest end of Los Negros (147.386E 1.990N) by 21 April. A second runway was later added at Mokerang and the Navy built a 5000' (1520 meter) runway on Ponam Island, off the north coast of Manus well to the west of Seeadler (146.885E 1.914S), and a 4500' (1370 meter) runway on Pityilu. 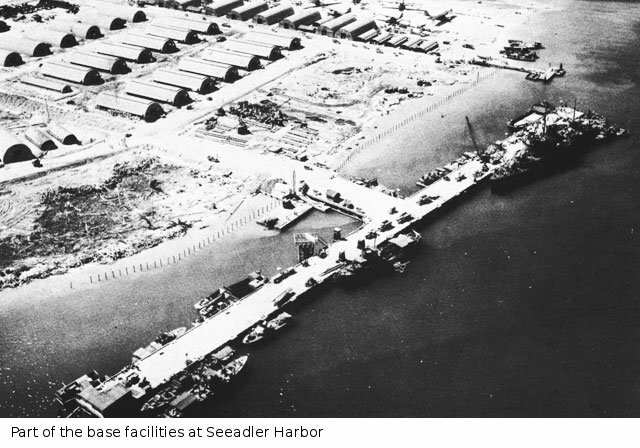 These construction efforts were supported by 1230 native workers in addition to the Seabees and Army engineers.